Discover the life-changing power of Scripture! This beautiful book brings together 100 of the best-loved Bible verses, each accompanied by an inspiring devotion and prayer. The pages are enhanced with botanical themed illustrations, making this a truly uplifting gift. 19.6 x 13.3cm. About "100 Favorite Bible Verses"
Discover the life-changing the power of Scripture. 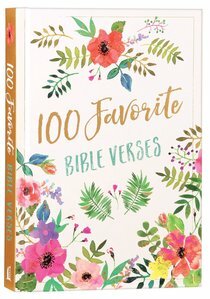 100 of the best-loved Bible verses bring encouragement, direction, insight, and hope for your life in this beautiful book. Each verse, paired with an inspiring devotion and prayer, will help you easily access God's truth and wisdom. Combined with beautiful botanical-themed illustrations, 100 Favorite Bible Verses is a comforting and uplifting way to start each day.